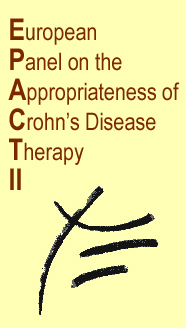 The aim of this site is to assist the practicing physician in deciding appropriate therapies for Crohn's Disease (CD). in each chapter you will have to define the localization of the disease and prior therapies and you will be able to see if the treatment you intend to give to your patient is appropriate or not according to the opinion of the experts who participated in the setting of the EPACTII criteria. On the site, you will also find a definition of the quality and appropriateness of health care, a presentation of the project, a list of the experts who participated in the project, the names of the sponsors and a complete list of references for each chapter. We hope you will benefit from the help given by this site in the management of CD and look forward to hearing from you.